If any of you have taken a spin through my blog, you may have noticed that I don’t really post many recipes for desserts or baking. Actually, I have 2 in total: one recipe for Pumpkin Pie and one for Coconut Chocolates. Truth be told, I have a wicked sweet tooth and a flagging metabolism and any baking I do, is just inhaled in a heartbeat; so I don’t do very much. However, when I do feel like whipping up a sweet treat for a party (like Fiesta Friday), I often turn to a superb cookbook called “Brownie Points”, by Lisa Slater, where I found this recipe. These brownies almost defy description – they are the epitome of decadence – not quite brownie, almost fudge, and far more luxurious than mousse. Then there is the flavour of the blood oranges – so much more intense and mysterious than regular oranges. And the balsamic vinegar? You know how it complements strawberries? Well, it works even better with blood oranges! When I told my mom about this recipe, the first thing she asked was if I was putting any icing on them. Believe me when I tell you that these brownies do not need an icing. They are the icing; but do serve them with the crème fraîche or a dollop of whipping cream. The slight tang of the crème fraîche complements the chocolate perfectly. 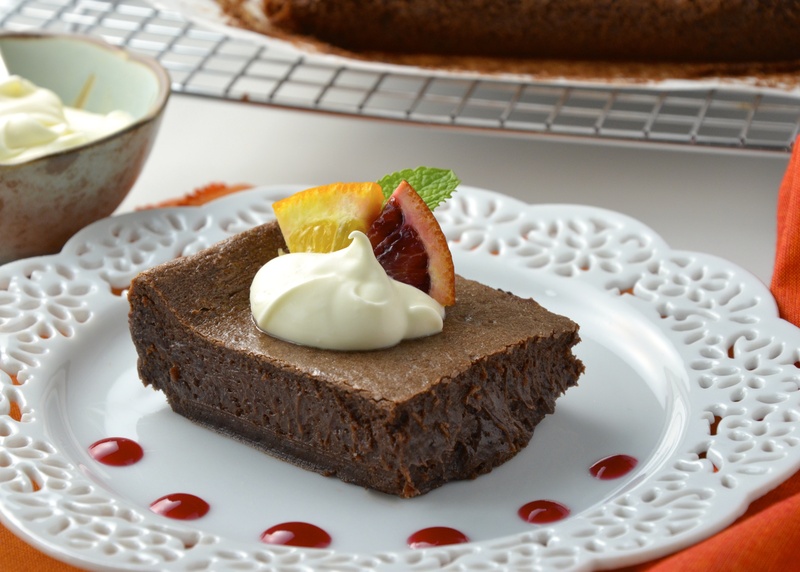 The blood orange coulis makes this dessert an experience, not just another brownie. I really recommend that you take the extra time to make it. I am bringing a big slab of this over to the gang at Fiesta Friday, hosted by Angie, who has been generously opening up her blog, The Novice Gardener, for us every Friday now for 6 weeks. So party gang, I know you all love your desserts because I have been sampling them at the soirée. Honestly, I have been a bit intimidated to bring a dessert, because you all do it so well, but my hubby assured me you would love it. Please grab a piece, and if there are any leftovers, I want you to take them home with you! We have eaten ½ the pan and we can’t eat any more! Preheat oven to 300°. Line a 9 × 9 inch pan with overhanging parchment paper. Place the butter in a microwave-safe 2 cup measure. Place in the microwave and melt for about 1 minute. In the bowl of a food processor, place both chocolates, cocoa powder, sugar and salt. Process until powdery. Add the grated orange zest. Whisk together the vinegar, orange juice and eggs in a separate bowl. With the processor running, add the melted butter through the feed tube. Scrape down the sides. With the machine running, pour in the egg mixture and pulse to blend thoroughly. Add the flour and blend briefly until smooth. Pour into the prepared pan and bake for 30 – 40 minutes or until just set. Cool completely before removing from the pan. Leave the paper on while you cut the brownies with a knife that has been wiped clean after each cut. Place all ingredients in the bowl of a food processor and purée for a minute until completely incorporated. Place in a strainer overtop of a bowl and remove all solids. Cover the juice and place in the fridge for 24 hours until it is thickened. Note: Mine didn’t thicken enough for my liking, so I thickened it with a bit of cornstarch and cold water the next day. Whisk together the whip cream and sour cream and place in a clean jar. Leave at room temperature for 12 hours. Stir and refrigerate for 24 hours. It will be really dense after that amount of time. Serve on top of the brownies. Garnish the plate with some of the coulis and pass some extra! These look terrific, Julianna. And I have the same problem making desserts – I am the one with the sweet tooth more than my hubby so I end up gobbling it all! Blood oranges and balsamic vinegar in brownies! What a wonderful and wild combination. I am intrigued and so excited by this recipe. Happy Friday! Smart! But really, these would be a huge hit with my family. I’m going to test it and see if they can guess what’s in it. 🙂 Let me know how it goes! So glad you think so! Have a great Friday! These look wonderful Julianna, your photo is stellar! 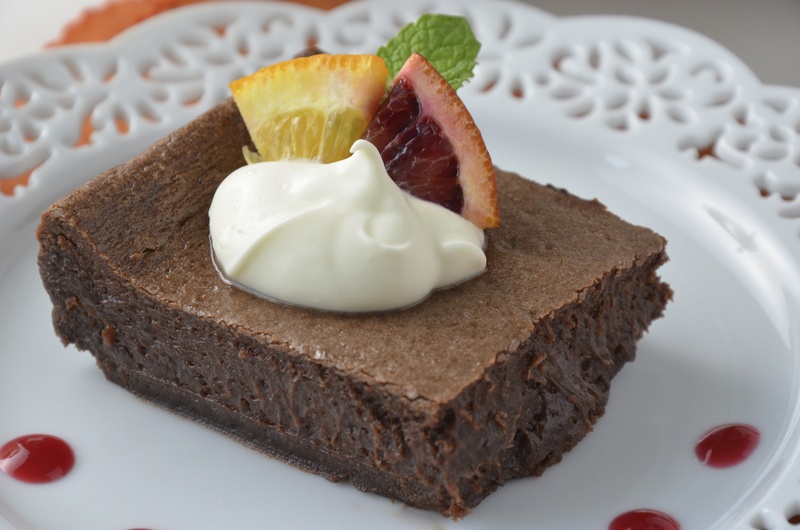 I’m not much of a dessert fan myself, but I can appreciate a good brownie and blood oranges are sooooo good too! Thanks Geraldine! I think you and I are more into a good bowl of soup! But my husband is really into blood oranges these days, so my head is swimming with ideas for them. Aren’t they amazing? 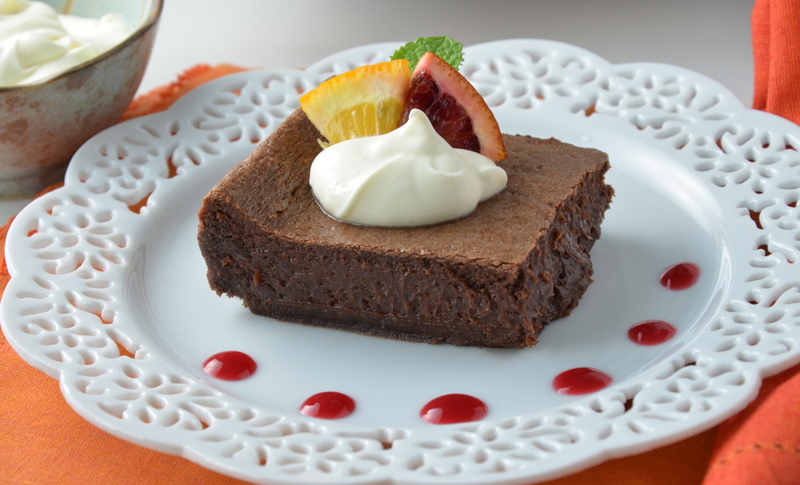 From the look of this brownie, apparently you can’t go wrong with chocolate and orange – Wish I could have a bite right now! Lol, I’ll be anxiously awaiting your success! Pretty dessert! Glad I found it at Fiesta Friday! I love it! I love the presentation and the recipe! Well done!!! Thanks so much Serena! Coming from you I take that as a supreme compliment! Have an awesome weekend! Yes! I can believe that those brownies could be inhaled in a minute…the combination of flavors lookswonderful! So glad you think so! Some people might think it weird to have the Balsamic vinegar in a brownie. Thanks so much for stopping by! Brownies with exotic ingredients… does it taste sweet’n’sour? Well I wondered about that before I made them, but no, they are just rich and luxurious. Julianna, I think you’ve out-done yourself! What incredible flavors you have going on here. So inspiring. The coulis sealed the deal for me. Looks so yummy! Thanks so much, Lisa! I love that coulis too! I have been sneaking little spoonfuls of the leftovers when nobody is looking…and then there is that wicked leftover Creme fraiche…sigh…what’s a girl to do? Thanks so much for your enthusiasm, Angie! I will tell my hubby that he is now the official taster! He will be so happy to have an official role in all this :-). Awesome soirée, by the way – you know how to do this! can I interest you in another piece of brownie? Julianna, this is the fanciest brownie I’ve ever laid eyes upon, and I’ve eyeballed quite a few brownies in this lifetime! Wowsers! Hey Patty, thanks so much! I won’t take all the credit, though. This little cookbook has the best brownie recipes I have ever made and super unusual. There are a bunch more that I just have to make! Have an awesome weekend! Thanks, Julianna! Same to you! Yum, this looks delicious! Balsamic Brownies sound so intriguing- never tried that combo before! Well, honestly I had never tried it before either, but it really works! Well, welcome to Fiesta Friday!! I am loving these weekly parties and I’m sure you will too! A true meeting of the foodie minds! Yes, I could bake more often, but I would have to buy a larger pant size 🙂 Might be a bit too expensive for my life style! See you next Friday! Thanks Prudy! Glad you enjoyed the post! I had never tried this combo either, but it really is awesome! Try it for a party sometime and make sure that lots of people are coming so it all gets eaten up…we people with sweet teeth, don’t want leftovers – bad news! I will take two squares, please! So many things going on in this dish, so many layers! Totally something you would find on a fancy restaurant’s menu! Only the finest in our house…(just kidding!) I figured that since I don’t really bake, I would like to try something more unusual. Thanks so much for stopping by to make a comment! I really appreciate it! Thanks so much! We just finished up the leftovers with some family and they all agree it is a very interesting dessert! All of the flavours really work! Thanks so much for taking the time to comment! Have a lovely week! Thanks so much! Yes, I would save these for a special occasion. They are so lovely and rich! What a lovely combination of ingredients and flavours, and a beautiful presentation of the dessert. I would definitely want to eat these brownies for dessert. Dear Julianna, these look absolutely lovely! I hope you don’t mind me placing a link for these on my blog!